It’s been a busy couple of months for the ORC agroforestry team and our Abacus colleagues. 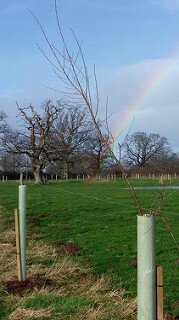 The second round of UK agroforestry network group meetings took place during January and February. In the UK we have chosen to develop three sub-groups focusing on livestock, arable (combinable crops) and vegetable cropping systems with network members choosing to join as many of these events as they wish depending on their preference and the subjects addressed. The 'Trees and Vegetable’ group were the first to meet on 11th January, at Duchy Home Farm, Tetbury, Gloucestershire; next up were the ‘Trees and Livestock’ group on 25th January at The Farm, Longnor, Shropshire, and finally, the ‘Trees and Arable’ group on 15th February, hosted by AFINET partner Stephen Briggs on his farm just outside Peterborough in Cambridgeshire. In total 92 people attended the events, an excellent turn out despite the chilly weather! Each workshop followed a similar format – after brief introductions setting the aim of the day, the groups headed out onto the farms to visit the agroforestry systems. Back in the meeting rooms, other agroforestry practitioners shared their journeys and experiences with the group. Afternoon discussion groups compared each other’s journey towards agroforestry, identified obstacles, innovations and decided upon the content for our next meetings so we can deliver to member specific requirements.